We use are 5 senses everyday! Set up a wonderful and simple discovery table for early childhood discovery and play. 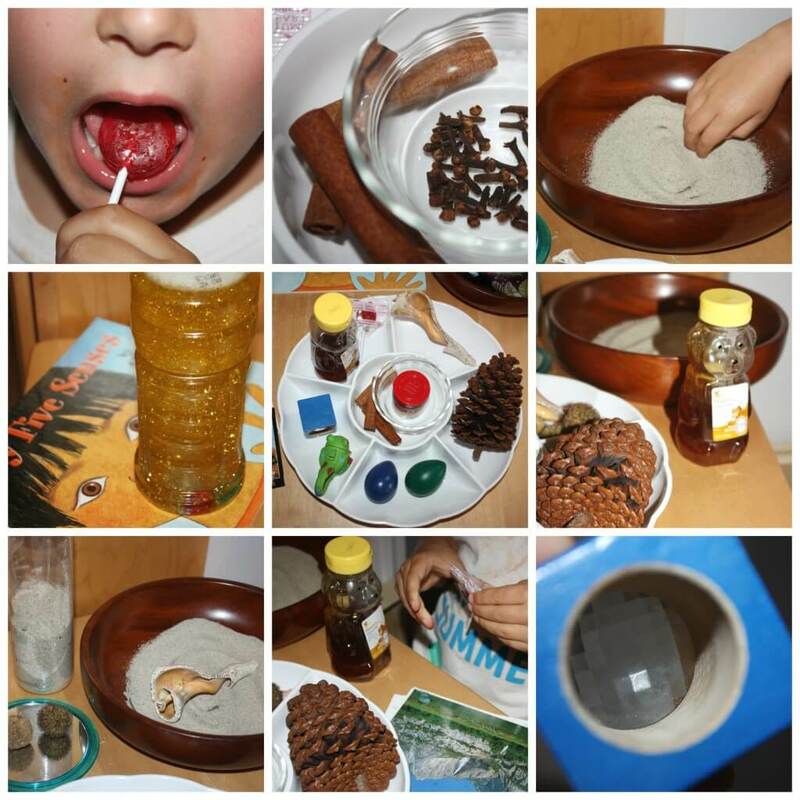 This 5 senses activity will be delightful for kids to explore their own senses and learn how their bodies work! Easy science for young kids using everyday items around you! Simple science for kids is perfect for early learning. This 5 senses activity was sparked by this simple book I found at a local thrift store. I adore these Let’s-Read -And- Find -Out science books. 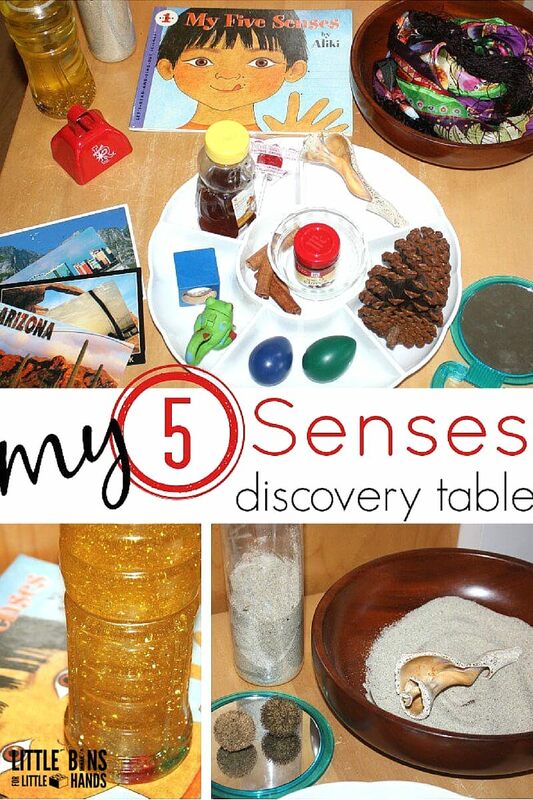 I chose to set up a science exploration table with a simple 5 senses activity. I combined different elements from around the house to set up our 5 senses invitation. Explore taste, touch, sight, sound, and smell. 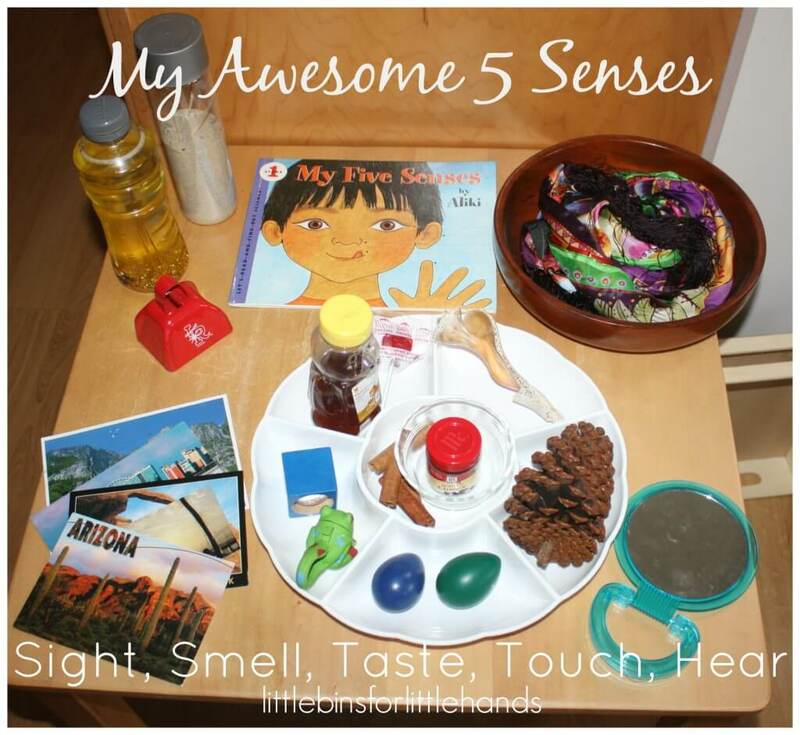 Set up this simple 5 senses science table with me of the items that we tried at home! For sight try a small mirror, kaleidoscope, mini flashlight, and glitter sensory bottles or these science discovery bottles! For smell try whole cloves, cinnamon sticks, lemon, and flowers. Are lemon scented sensory rice or vanilla cloud dough is also great for the olfactory senses! For sound try a bell, shaker eggs, or a whistle. Build simple instruments! Try making a rain stick! For touch try a silk scarf, rough/smooth conch shell, sand, large pine cone, and tree pods. We also have awesome sensory play recipes for tactile activities. Make textured sensory balls with balloons! Use a divider tray or small baskets and bowls to hold items. Make sure to read a book about the 5 Senses too! At the beginning of the week, we sat and read the book together. We talked about everything around us. We talked about what we could and could not touch. We also talked about how you can see something and not hear it. We thought of times we used more then one sense. Through out the week I watched him wander over and flip through the book, stop to examine an object and make funny faces in the mirror. He also loved the super easy glitter sensory bottle with treasure (see how here)! Help your child increase his ability to explore and wonder with simple open ended questions. If your child is having difficulty with the materials, model a way to use it, feel it or smell it. Offer a turn, give some time for your child to become familiar with the ideas and items. Then ask a few questions to get the wheels turning. Tell me what you are doing? Where did you think it came from? 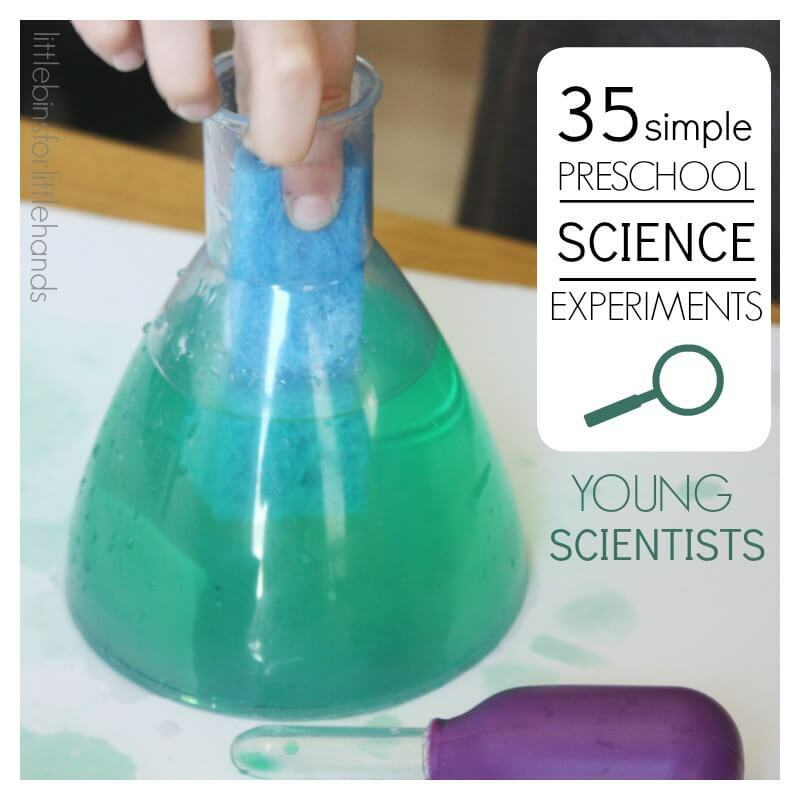 Check out more awesome preschool and kindergarten science activities to try at home or school! Discovery/Science tables work well for us too! I love this one! Great find with the book!